Did you know that listening to international kids songs; is a great tool to help teach children about the unique world they live in? Listening to world music is a great way to share customs and traditions, as well as basic language - helping to appreciate the world around them. Many parents look for ways to teach their children to appreciate different cultures and celebrate diversity in the world around them. While some choose to travel to destinations, others find simple ways of experiencing the world, right in the comfort of their own home. Experiencing new music from artists performing in other countries can provide a fun, upbeat and entertaining way to introduce children of all ages to and in most cases getting their skills moving is educational and enjoyable at the same time. Music can help a child develop a number of their cognitive skills including memory, language skills and mental association. Music is great way for children to both understand and express what they think and how they feel. Encourage movement while listen to music and see where it takes them. 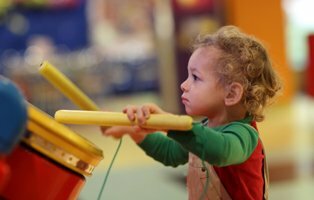 Songs with motions help children practice fine-motor coordination. Doing the finger motions of a song like "The Itsy Bitsy Spider" helps children practice their hand and finger control -- a skill necessary for writing and handling small objects. Dancing to music also helps children perfect their control of their arms and legs. Listen to some music. Encourage your child to describe the music. Is it fast or slow? Can they identify any of the instruments being played? If possible, show a photograph of the musicians or instrumets. If there is a special dance you know, show your child some basic movements or, invite them to create her own movement. Introduce the rhythm instruments so that they can play along. If you're courageous you can look to build your own instruments. If your child likes to sing, record them. They'll love hearing themself on the recording and will appreciate the memory later.